My program uses the printer port and a very simple 2 wire cable. Some use a special hardware device that has a serial interface for the computer. In my case, I didn't want to have to build any special hardware. It only works on older GM vehicles with C3I injection modules which output data at a tortoise-like 160 bits per second. I used ground (25) and the 'Busy' pin 11. Any of the printer status pins will do really. Warning: My ECM outputs 5 volts which the Parrallel Port is happy with. Some models output 12 volts and that's too high and is even more likely to fry something. 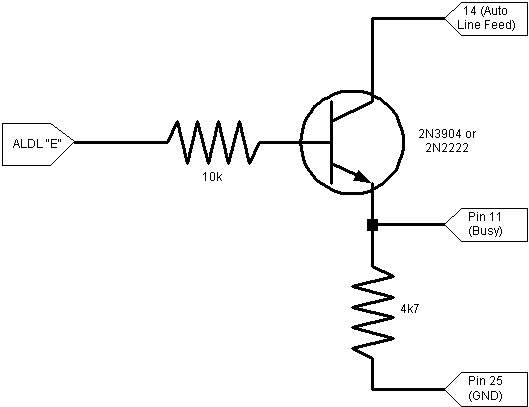 If yours sends 12 volts, consider using the circuit below. A simple 1-transistor interface, thus isolating the two machines. I soldered this together in the parallel cable head, and it works just fine. I did bring the ground of the ALDL connector to the ground of the parallel port with no problems. Since the parallel port doesn't bring +5V to the printer for any reason, I tapped the +5V off the mouse port. Worked for me. But its more hassle for others, so I drew my schematic to utilize one of the in/out control pins, which your program would need to make "high" at all times you want to read data. Note: Anyone with suggestions please send them in! Note: It's not my diagram and I don't use Diacom software. Try it at your own risk. If diacom is trademarked, servicemarked, or watermarked then that's their business, I have nothing to do with it. The newer vehicles are at least 8192 bits/second, for those you can probably make a fairly simple serial cable with a voltage level-shifting chip. I dont have one and so I dont care. Why do you need the V.L.S. chip in the later ECM and not the C3? The newer 8192 bps format can be read by a conventional serial port if you pull some timing tricks, making the software's job much simpler, and you don't need a fast computer. The ALDL on my car outputs 5 volts or 0 volts dc. Serial data needs to be +12/-12 or sometimes +5/-5. That's what the level shifter chips can do.